We recently discussed 2018 bedroom design trends on the blog. We offered tips for home decorating and purchasing furniture. Vintage and vintage-inspired metallics of all kinds are en vogue for the whole home, including silver, brass, golden tones, and everything in between. One home trend that incorporates this is nailhead trim! Many of our new products feature this trendy style. 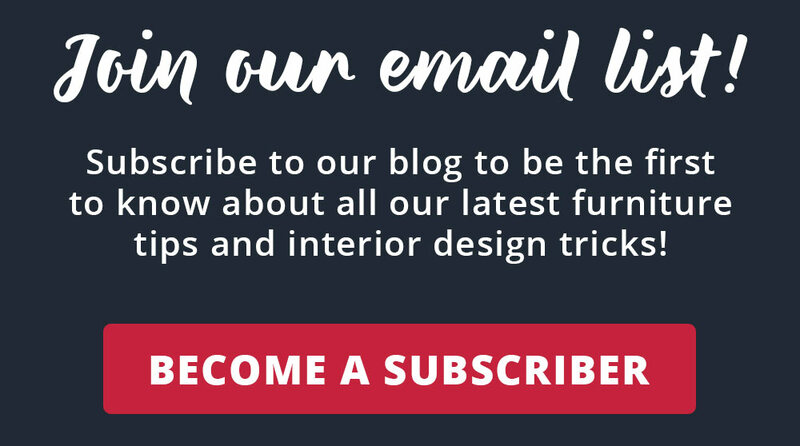 Today we’ll share what exactly nailhead trim is, what we love about it, tips for decorating with it, and favorite products feature this style. Originally a simple way to attach fabric to the furniture frame, nailhead trim has now become decorative flair. The name “nailhead” comes from the original nail’s heads that showed after upholsterers finished attaching fabric. Recently resurrected as a throwback trend, this embellishment can be found on sofas, loveseats, dining room chairs, headboards, kids beds, motion furniture, and just about any type of home decor or indoor furniture. This metallic detailing offers many values. First, the neutral metallic tone matches any decor. In addition, even if it goes in and out of style, it will clearly always be relevant. This trend started in the 1800’s! Furthermore, it can tie multiple pieces together that both feature metallic sheen, that otherwise wouldn’t fit. This trend is very versatile. 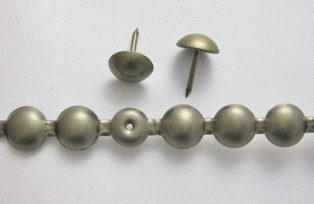 Some designers say to stick to just one metallic nailhead tone, whether it be brass, silver, or gold. It can be found on sofas and loveseats, kids beds, dining room sets, upholstered headboards, and all types of home accessories. 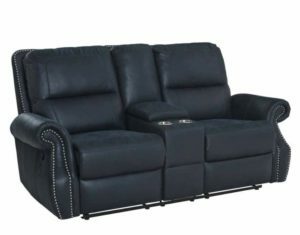 One of our favorite new reclining sofas is navy blue, soft to the touch, and a real statement piece for your living room. It’s called the Kingston, and customers love the set! 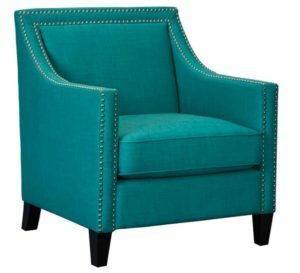 We are loving the new Erica accent chairs with nailhead trim! They come in charcoal, taupe, teal, denim blue, berry pink, chocolate, and a black French script on a cream background. Click here to see all of the trendy new Erica accent chairs. 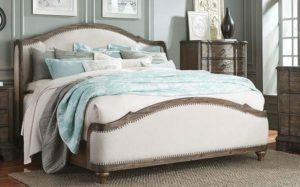 Adding a nailhead trim upholstered headboard to your bedroom adds a nice statment piece. We offer the Parliament bedroom set, pictured here, with a headboard and matching footboard upholstered in cream, linen-like fabric and adorned with nailhead embellishments. Furthermore, we sell kids beds with this style too! Click here to check out this adorable pink Gabby bed. Are you redecorating? Click here for details on affordable packages. Previous PostWhen All is Said & Dunmore: We love this new dining set!